Pork loin was on sale this week for a pretty good price, so I bought a package that came with 2. The other one I stuck in the freezer. Don’t be intimidated by the big hunk of meat that it is. It’s actually really easy to work with. This turned out really great! Chloe even ate a bunch of it. Hope you enjoy it too. In a large skillet, heat olive oil over medium-high heat. Add bell pepper and onion and cook until they begin to soften, about 5 minutes. Add mushrooms and garlic. Cook until tender and season with salt and pepper. Butterfly the pork loin by cutting it open like a book. 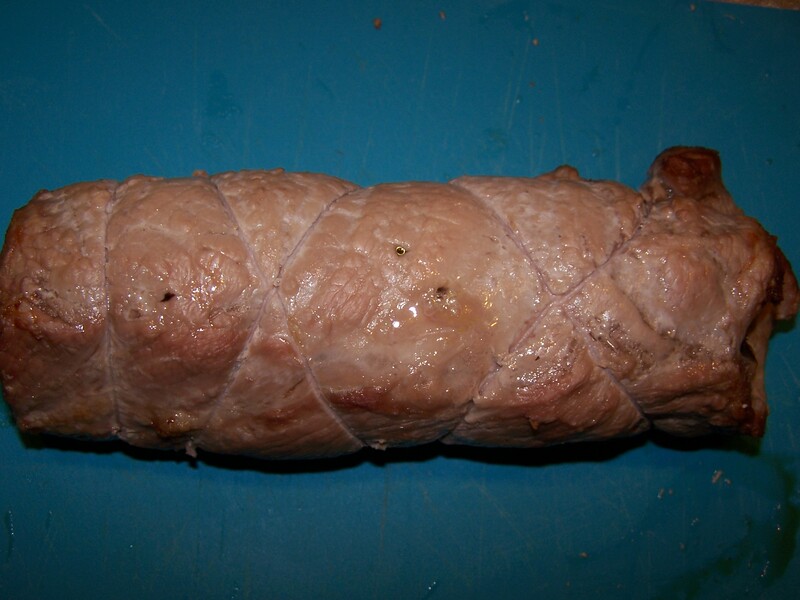 (See Apple Stuffed Pork Roast post for detailed pictures). 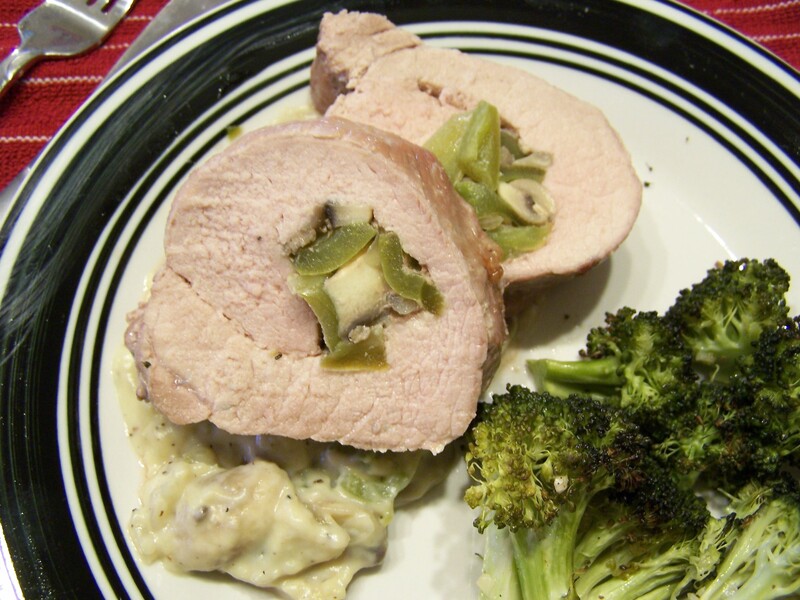 Place half of the mushroom mixture in the center of the pork loin and roll up. 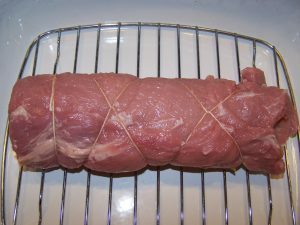 Tie with kitchen twine and place on a roasting pan. 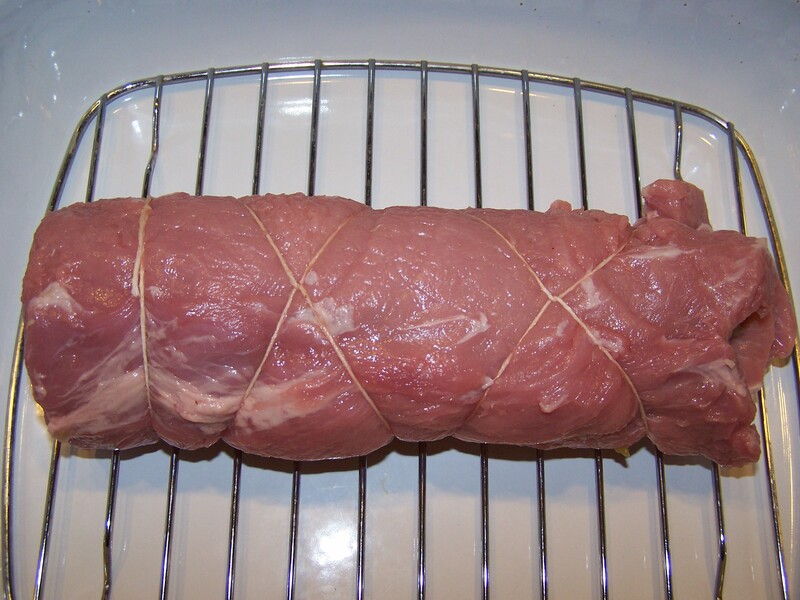 Roast until the pork reaches an internal temperature of 145°F, about 1 hour. Let rest at least 5 minutes before slicing into 8 slices. Before the roast is finished, make the sauce. In the skillet with the other half of the mushroom mixture, heat to medium-high heat. Move the veggies to the side of the skillet and melt the butter. Stir in flour and cook for 1 minute. Whisk in milk, bring to a bubble and reduce heat to medium. Simmer until thickened, about 5 minutes. Season with salt and lots of black pepper. To serve, place some of the sauce on a plate and top with 2 slices of the stuffed roast.